Human activity is overloading our atmosphere with carbon dioxide and other global warming emissions. These gases act like a blanket, trapping heat. The result is a web of significant and harmful impacts, from stronger, more frequent storms, to drought, sea level rise, and extinction. Increasing the supply of renewable energy would allow us to replace carbon-intensive energy sources and significantly reduce global warming emissions. A decade ago, Melbourne was gripped in drought. Water storages had fallen to below 30% and widespread water restrictions were in place across the city. Since the last drought hit Melbourne a decade ago, the city’s population has ballooned by 965,000 or 26%. The city’s population is also projected to expand by 96,000 people a year for the next 35 years until Melbourne is 73% larger at more than 8 million people. With Australia getting drier, and the population exploding, the question needs to be asked: how will Melbourne avoid catastrophic drought? There are two of prominent data have been reached as a result of search through all the meteorological documents related Melbourne and especially St Kilda Harbor. First, the average daily wind speed is 20.4 around St Kilda Harbor which is pretty proper value for (making benefit from) utilizing wind energy. Other crucial data is average daily humidity of Melbourne. Humidity rate reaches 60% in Melbourne that quite optimum level to achieving water from air humidity. VAWTAC has been design based on these two data which uses wind and humidity. The main working principle of VAWTAC is as below, wind calls any direction (min. 4km/h) starts whirl the wind turbine. Whirling rotors transmit the torque to power generators directly and generators become producing electric energy. Each generator produces their maximum capacity when wind velocity reaches 15 km/h. In terms of above the that level of wind velocity, generator conducts additional power to the gearbox. The gearbox shifts the gear up proportional to incident energy and all the power be transmitted to vacuum fan. (Traditional similar systems use breaking mechanism for high wind speed conditions and possible additional energy has been absorbed. Wind turbine rotors and generator provide their maximum capacity on 15km/h wind velocity, above the value of wind speed, additional produced power transmits to vacuum fan thanks to gearbox. Our system doesn’t include any brake mechanism unlikely traditional systems. The gearbox provides brakes the rotors via shifting gear up to protect rotors over-run without any brake mechanism. The gearbox also provides transmitting additional energy to fans to make profit all wind energy but any loss. )In that way the system begins vacuuming outside air to system. Vacuumed humid air be refined while passing through a “air filter”. The clean humid air that reached condenser, condense here and turn to water drops. After that, condensed air filtered by a carbon filter. Filtered clean water accumulate in a water tank. 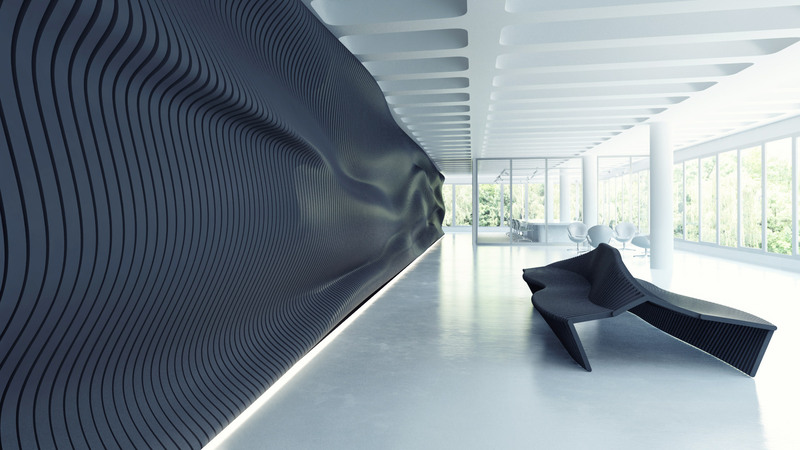 The air purified of humid and dust exhausted from top of the system. Acquired water will provide shower need whom people have a swim. At the same time each VAWTAC has six water dispenser. The water coming through from tanks may be chilled to drink. Another feature of VAWTAC is water tray for animals such as cats, dogs, birds etc. Unused streamed water from the dispenser tap accumulate pet tray where is below the dispenser. In addition, surplus water in tanks will be used for green-fields around. Almost all the mount of generated electric from VAWTAC transfers city power substations, very tiny part of energy used for condenser water pump and chilling the drink water. Yachting and especially sailing draw interests in Melbourne City. In that fact World Sailing Olympics organized each year in Melbourne. There are numerous yachts and sails on St Kilda Harbor. 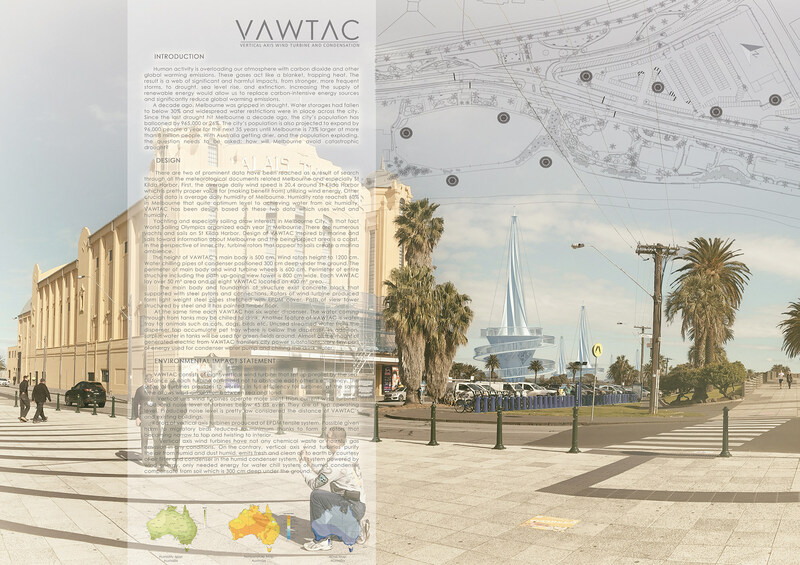 Design of VAWTAC inspired by marine and sails toward information about Melbourne and the being project area is a coast. 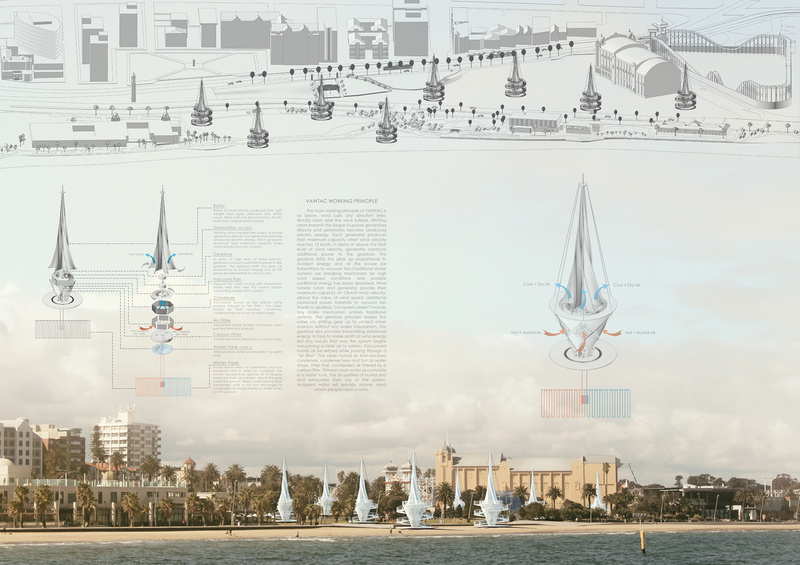 In the perspective of inner city, turbine rotors that appear to sails create a marina ambience. The height of VAWTAC’s main body is 500 cm. Wind rotors height to 1200 cm. Water chilling pipes of condenser positioned 300 cm deep under the ground. The perimeter of main body and wind turbine wheels is 600 cm. 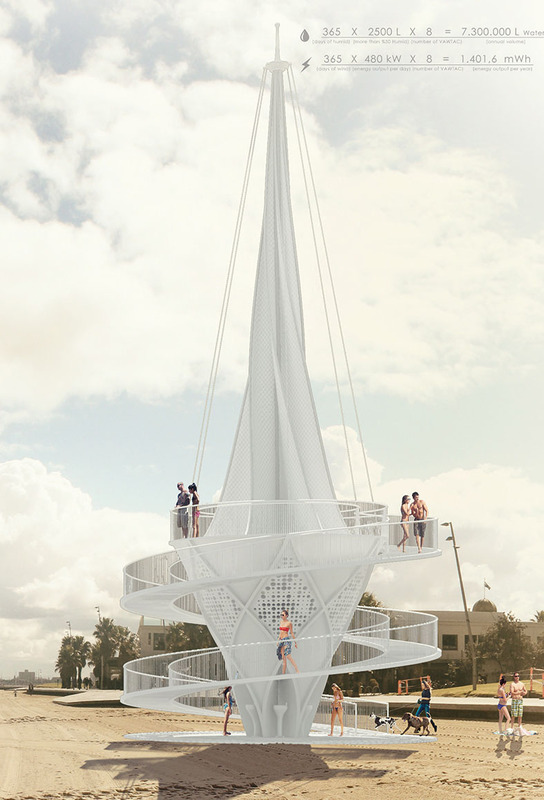 Perimeter of entire structure including the path up-going view tower is 800 cm wide. Each VAWTAC lay over 50 m² area and all eight VAWTAC located on 400 m² area. The main body and foundation of structure exist concrete block that supported with steel pylons and connections. Rotors of wind turbine produced form light weight steel pipes stretched with EPDM cover. Path of view tower structured by steel and it has painted timber floor. 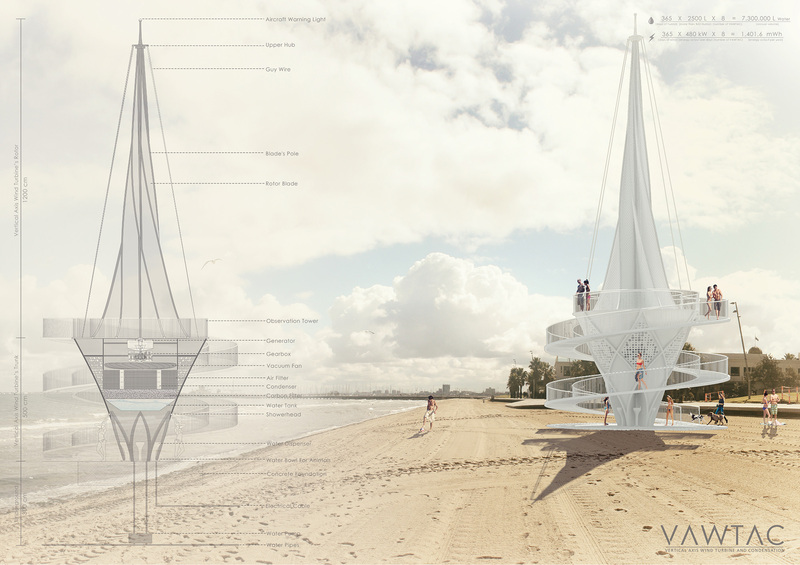 VAWTAC consists of eight vertical wind turbine that set up parallel by the sea. Distance of each turbine optimized not to obstacle each other’s efficiency. 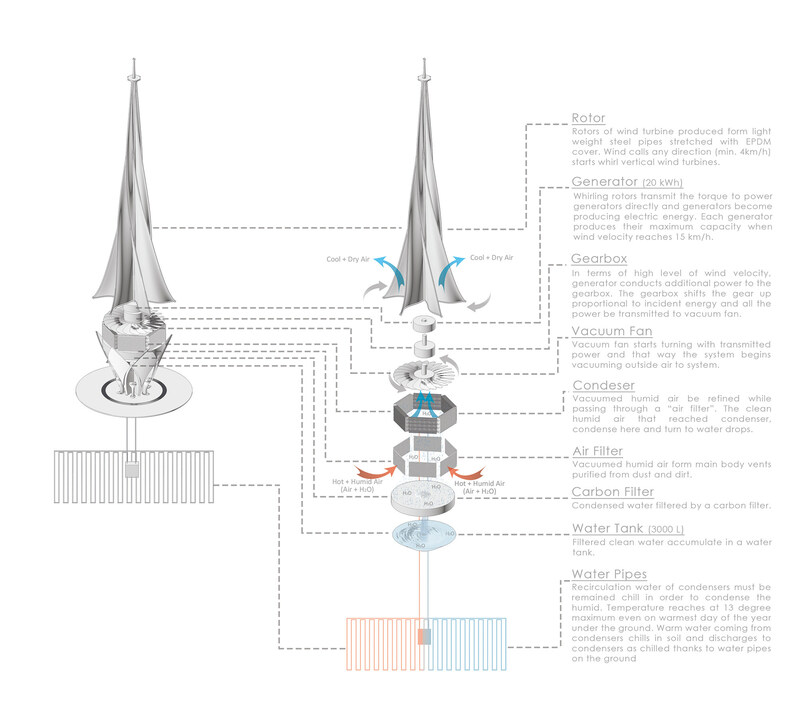 The setup of turbines provides to working in full efficiency for turbines, at the same time allows wind circulation between sea and land. Vertical axis wind turbines operate more silent than current wind turbines. Produced noise level of turbines below 45 dB even they are at top operating level. Produced noise level is pretty low considered the distance of VAWTAC’s and existing buildings. Rotors of vertical axis turbines produced of EPDM tensile system. Possible given harm to migratory birds reduced to minimum thanks to form of rotors that becoming narrow to top and twisting to interior. Vertical axis wind turbines have not any chemical waste or harmful gas emission in any conditions. On the contrary, vertical axis wind turbines purify the air from humid and dust humid, emits fresh and clean air to earth by courtesy of air filter and condenser in the humid condenser system. All system powered by wind energy, only needed energy for water chill system of humid condenser compensate from soil which is 300 cm deep under the ground.